The Indigenous Peoples of Biafra (IPOB) has vowed to go on reprisal if Igbo people are attacked in any part of Lagos again. Mario Reporta understands that there were pockets of violence in some areas believed to be dominated by the Igbos in Lagos during the 2019 presidential and National Assembly elections. Also, there was a little troubles as some shop owners, said to be Igbos, were not allowed to open for business in the Oshodi area of Lagos on Monday. 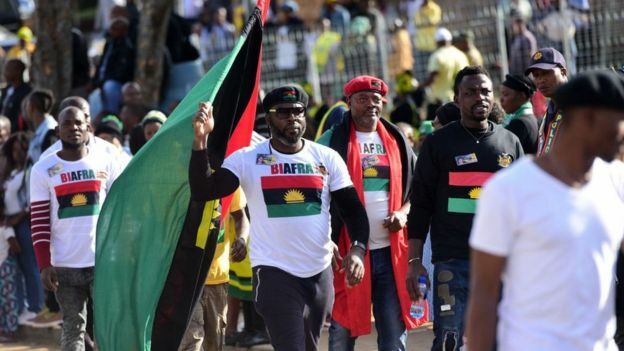 These developments have left the pro-Biafra group fuming as it warned that there might be reprisal attacks if such incidents happen again, Concise News learned. “We the global family of the Indigenous People of Biafra (IPOB) and it’s leadership condemn in its entirety certain utterances and anti-Igbo sentiment emanating from certain quarters in Yoruba west and Fulani controlled north,”IPOB said in a statement. “The brazen attempt to threaten, intimidate and stop Igbo Biafrans from voting for their candidate of choice is unacceptable to any right thinking person and is confirmation, if any is needed, that Biafrans of whatever persuasion, is not wanted in Nigeria. In addition, it described as “unbelievable that some Yoruba leaders and their Fulani counterpart would summon the courage to ask Igbo/Biafran people not to vote for the candidate of their choice because they are not indigenes. “Some went as far as saying Igbos should go back to Igboland if they want to vote for any person other than APC candidate. “Our people living in Northern and Western parts of Nigeria must be prepared and never entertain any fear particularly those in Lagos and Kano States because any attempt to commence another round of ethnic cleansing of Igbos in the north or west, will be reciprocated in the east. This is as it urged “Biafrans living in any part of Nigeria, outside Biafraland must gradually prepare for total relocation of their businesses and families from Northern and Western Nigeria particularly Lagos and Kano States, because they have perfected plans to forcibly eject them from those states.